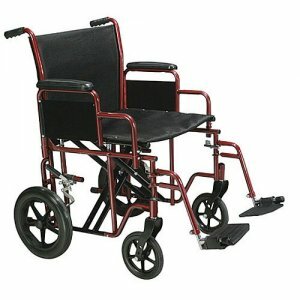 20 Inch Width Bariatric Heavy Duty Transport Wheelchair with Swing-away Footrest. - 450lb Capacity This Bariatric Steel Transport Chair in red by Drive Medical has dual, reinforced steel cross braces and a reinforced steel frame for added support can withstand a weight of 450 lbs. The heavy duty, nylon reinforced upholstery comes with a back carry pouch to easily and securely transport personal items. Comes standard with a roomy, comfortable 20" width seat. Limited lifetime warranty. Heavy-duty, nylon reinforced upholstery with a back carry pouch. 12" flat free rear wheels. 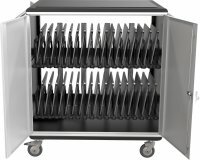 Width (Open): 24.5"; Width (Closed): 9"; Height: 37"; Seat To-Floor (Height): 20.5"; Back (Height): 16"; Width (Seat): 20"; Depth (Seat): 18"; Length with Riggings: 38"